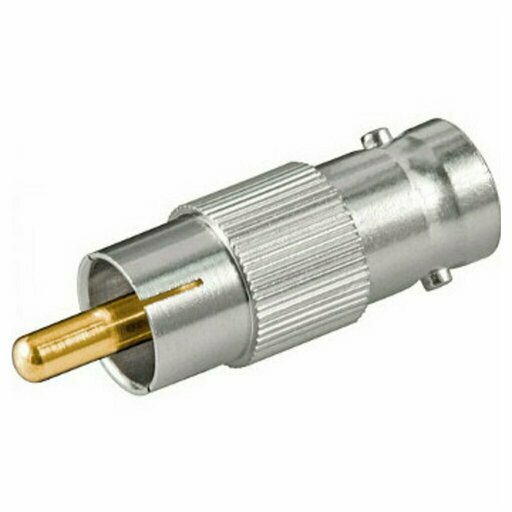 An RCA connector, sometimes called Cinch, is a type of electrical connector commonly used to transmit audio and video signals. The RCA name from the Radio Corporation of America, who designed it in the early 1940s for the internal connection of the reading head of the phonographs. It has a simple design and low cost. The connecting plug is called RCA plug or Jack to phono, phonograph or CINCH. In normal use, the cables have a connector standard on each end, consisting of a central male, surrounded by a ring. The ring is often segmented for flexibility. The ring is slightly smaller in diameter than the ring on the plug, and allowing it to be tight on top. The plug has a small space between the inner and outer rings which is filled by an insulator, usually plastic. The carrier signal pin emerges from the sheet and often comes into contact with the socket before meeting the ground rings. A continuous noise may occur if the plug is partially out of the socket. The RCA connectors are often classified by color, yellow for video composite, red for right and white or black audio channel for the left channel of the stereo. This trio (or pair) Sockets can be found on the back of almost all audio and video equipment. There are often one or more sets of jacks on the front of the modern TVs to facilitate the connection of camcorders, and gaming consoles other laptops as video sources. For audio, cables, obey the RCA S/PDIF specification, as defined by the international standard IEC 60958-3 for best performance.